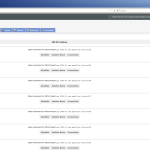 Build Your Own Oracle Infrastructure: Part9 – Build the Shared Storage Server. The last major hurdle we need to overcome before installing some Oracle software and building a RAC database is to configure shared storage. 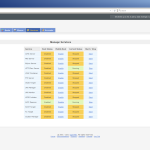 Shared storage is the key to making Oracle RAC work. The same storage concurrently visible to and updatable from multiple servers really is the heart of the system. Enterprise class dedicated SAN or NAS filers are very cool but very expensive. What we need is a scaled down economical solution which does the same thing. The answer? Openfiler! 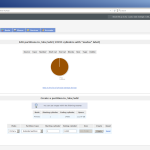 Task #3: Configure iSCSI Targets in Oracle Linux. 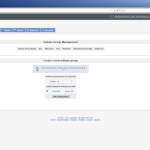 Task #4: Configure Oracle ASM. Download the Openfiler 2.99.1 ISO and burn it to a DVD using ImgBurn, then use the DVD to boot the shared storage server computer. 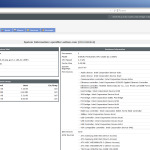 Installing Openfiler is very simple and similar to installing Oracle Linux. Since we’re not installing Openfiler in a virtual environment, it’s a bit tricky to capture screen shots of a bare metal install. So we’ll have to rely on a text description. Fear not, this install is ridiculously easy in completes in 8 simple steps. Task #1, Step #1/8: Press Enter to install in graphical mode. After the server boots from DVD, simply hit the Enter key to get the install started. Task #1, Step #2/8: Click Next. Once the GUI comes up, just hit the Enter key to continue. Task #1, Step #3/8: Select keyboard. Select your desired keyboard layout from the menu and click Next. Task #1, Step #4/8: Select installation drive. Select the option to Remove all partitions on selected drives and create default layout. Leave the first drive, sda, checked and uncheck the other drives. Finally, select sda as the boot installation drive and click Next. 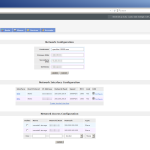 Task #1, Step #5/8: Configure network devices. Note, do not forget to disable IPv6 support and ensure both NICs are Active on Boot. Task #1, Step #6/8: Choose timezone. Select your preferred timezone from the menu. Leave System clock uses UTC checked. Click Next. Task #1, Step #7/8: Choose root password. Enter a root password twice. Write it down somewhere safe. Now! Don’t argue, just do it. Click Next. Task #1, Step 8/8: Install the software. A familiar looking left to right progress bar shows the installation’s progress. It only takes about a minute, then you’ll see a congratulations screen. Click Reboot. Note, this reboot sometimes sticks at a completely blank screen. Don’t be alarmed. If this happens hard power off the machine, then power it back on and all will be well. When the machine comes back up, it will display the URL for the Openfiler console, which in our case will be, https://200.200.10.6:446/. The default username is “openfiler” and the default password is, wait for it, “password”. No quotes of course. Installing Openfiler was quite easy. Configuring the storage it manages is a little involved. There are 8 steps to this. Pay close attention. Maximum attention to detail is needed here. Task #2, Step #1/8: Edit /etc/hosts. Task #2, Step #2/8: Enable iSCSI. 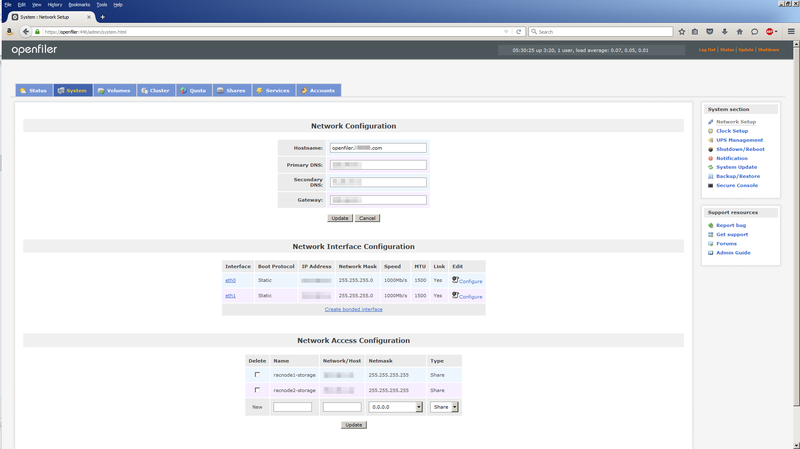 Task #2, Step #3/8: Network Access Configuration. Note, it’s tempting to put the hostname in the Network/Host column especially if you’ve added the correct entries in the Openfiler server’s /etc/hosts file. However, don’t! It doesn’t work when you come to discover the storage from the Oracle RAC nodes. You MUST use the IP address! Task #2, Step #4/8: Partition the Disk. Note, despite the values you used, Openfiler insists on keeping 5% of the disk free. Task #2, Step #5/8: Create a Volume Group. Task #2, Step #6/8: Create Logical Volumes. The logical volumes we create will eventually end up as ASM disks visible to the Oracle RAC node servers. 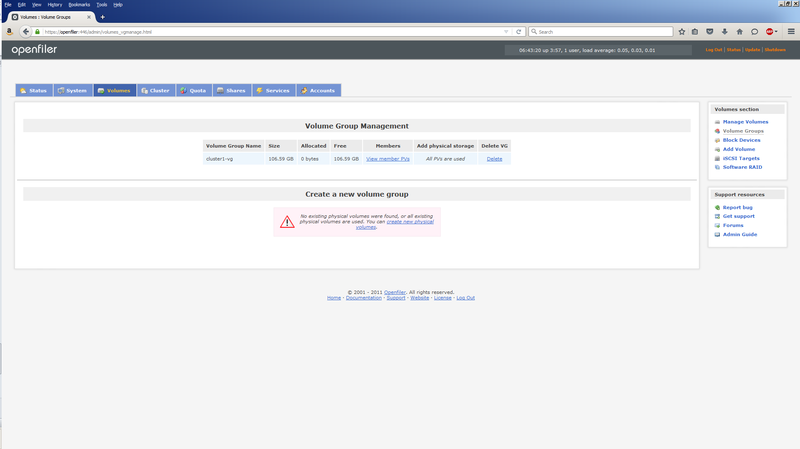 Task #2, Step #7/8: Create iSCSI Targets for Logical Volumes. An iSCSI target is a way of identifying the logical volumes. Since we have 10 logical volumes, we’ll have 10 iSCSI targets. An iSCSI target is actually identified by a Target IQN or iSCSI Qualified Name. The following procedure will need to be repeated for each of the 10 logical volumes. 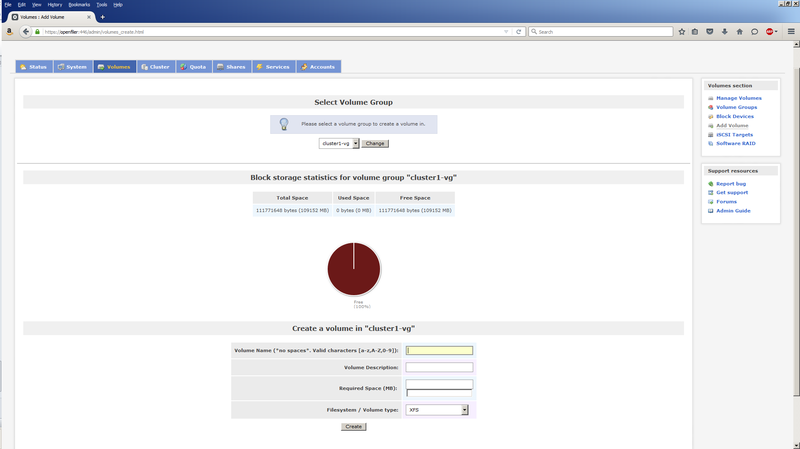 Click Volumes, then iSCSI Targets. Ignore the Settings section as we won’t be changing any of those values. Context is extremely important at this stage and you need to make sure your focus is on the correct object. 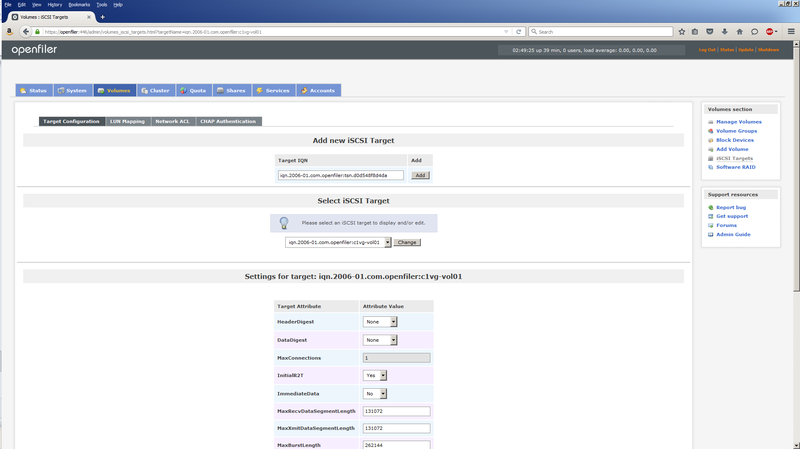 Therefore, make sure you select the Target IQN you just created from the Select iSCSI Target menu. If it isn’t, as will be the case after you create the first one, select the Target IQN you need, then click the Change button. Selecting the Target IQN from the menu isn’t sufficient. You MUST click the Change button to make it the ‘active’ Target IQN. 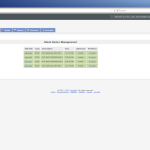 Next, click Network ACL (Access Control List). Here you define which hosts (Oracle RAC nodes) can have access to this Target IQN. Since Openfiler only knows about two nodes on the storage network (200.200.20.x), racnode1-storage and racnode2-storage are listed. Use the Access menu to change Deny to Allow. Click Update. The screen will refresh but nothing else happens which can be a little deceiving. As long as you hit Update and the screen refreshes (don’t blink or you’ll miss it), you’re fine. Click Target Configuration to go back to this screen and repeat the procedure for c1vg-vol02 through c1vg-vol10. 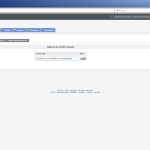 Task #2, Step #8/8: Review iSCSI targets. Our attention now turns to making the iSCSI targets visible and usable on the Oracle RAC node servers. To do that, we use the iSCSI initiator client which we installed back in Part 7. There are 6 steps in all, here we go. 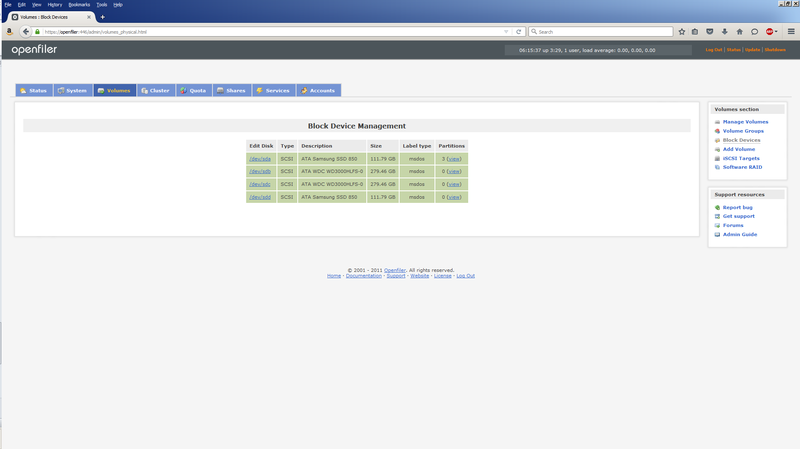 Task #3, Step #1/6: Verify iSCSI client (ALL nodes). 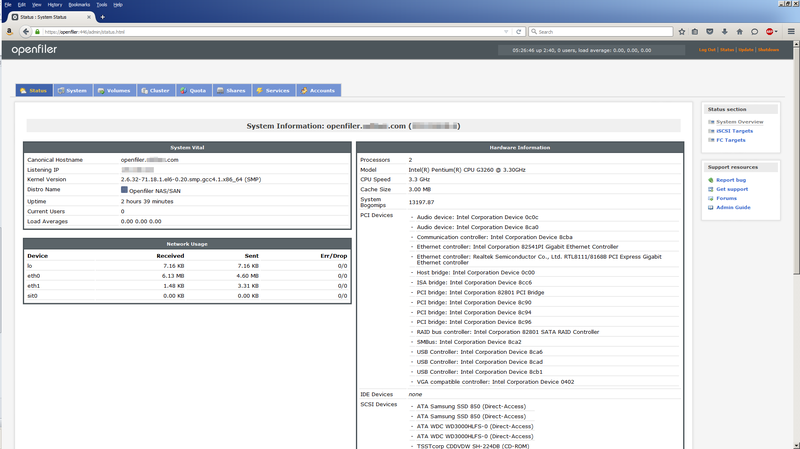 Trying to start the services has little effect at this stage, but running the iscsiadm discovery command makes everything spring into life. You’ll see. Perform this step on all nodes in the cluster. Task #3, Step #2/6: Discover iSCSI targets (ALL nodes). 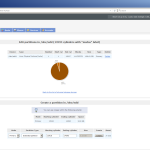 The iscsiadm discovery command starts the iscsid service and then discovers the iSCSI targets coming from Openfiler. 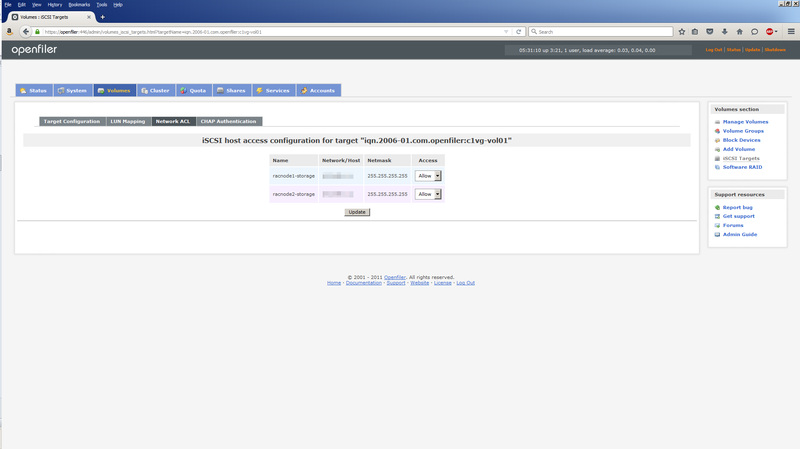 Note, we’re using the portal openfiler-storage (the -p option) which is on the storage network (200.200.20.x). However, the discovery output lists targets on the storage network AND the public network (200.200.10.x). I think this is an Openfiler quirk/bug. Needless to say, we’re only interested in the targets on the storage network. Repeat this step on ALL nodes in the cluster. 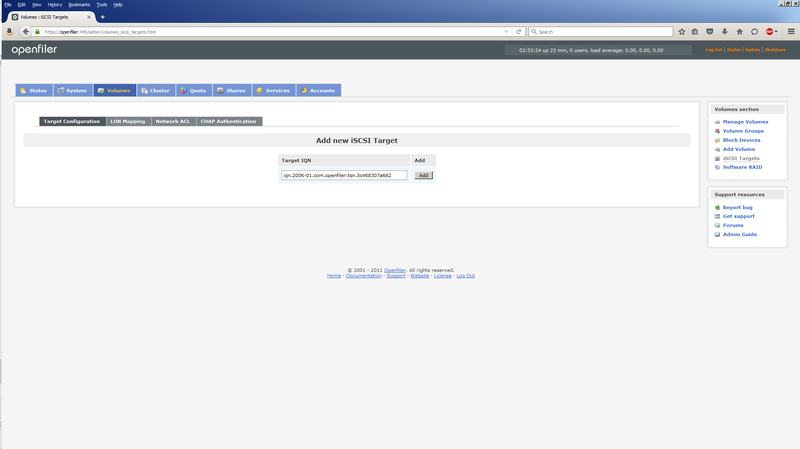 Task #3, Step #3/6: Login to iSCSI targets (ALL nodes). Login to [iface: default, target: iqn.2006-01.com.openfiler:c1vg-vol01, portal: 200.200.20.6,3260] successful. Login to [iface: default, target: iqn.2006-01.com.openfiler:c1vg-vol02, portal: 200.200.20.6,3260] successful. 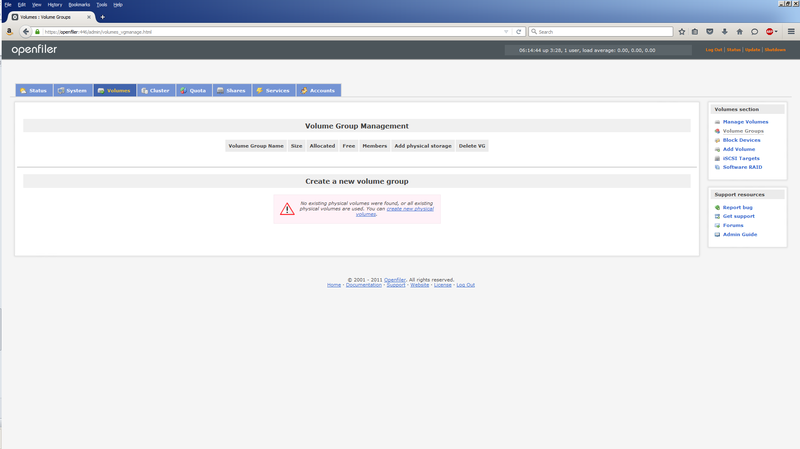 Login to [iface: default, target: iqn.2006-01.com.openfiler:c1vg-vol03, portal: 200.200.20.6,3260] successful. Login to [iface: default, target: iqn.2006-01.com.openfiler:c1vg-vol04, portal: 200.200.20.6,3260] successful. Login to [iface: default, target: iqn.2006-01.com.openfiler:c1vg-vol05, portal: 200.200.20.6,3260] successful. Login to [iface: default, target: iqn.2006-01.com.openfiler:c1vg-vol06, portal: 200.200.20.6,3260] successful. Login to [iface: default, target: iqn.2006-01.com.openfiler:c1vg-vol07, portal: 200.200.20.6,3260] successful. Login to [iface: default, target: iqn.2006-01.com.openfiler:c1vg-vol08, portal: 200.200.20.6,3260] successful. 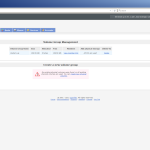 Login to [iface: default, target: iqn.2006-01.com.openfiler:c1vg-vol09, portal: 200.200.20.6,3260] successful. 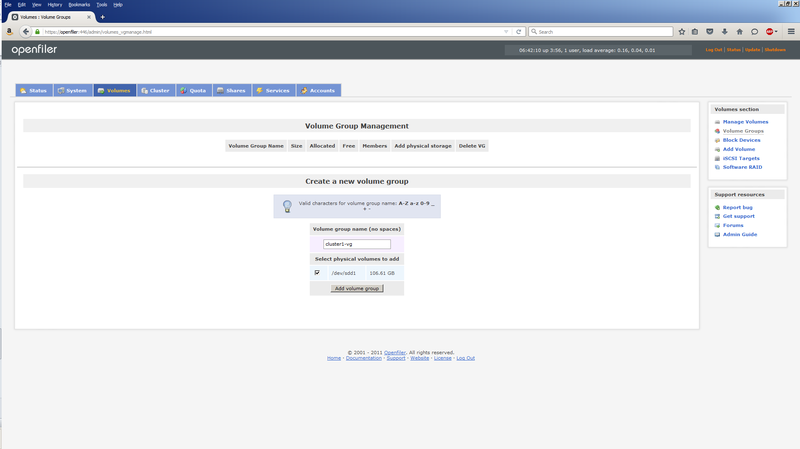 Login to [iface: default, target: iqn.2006-01.com.openfiler:c1vg-vol10, portal: 200.200.20.6,3260] successful. 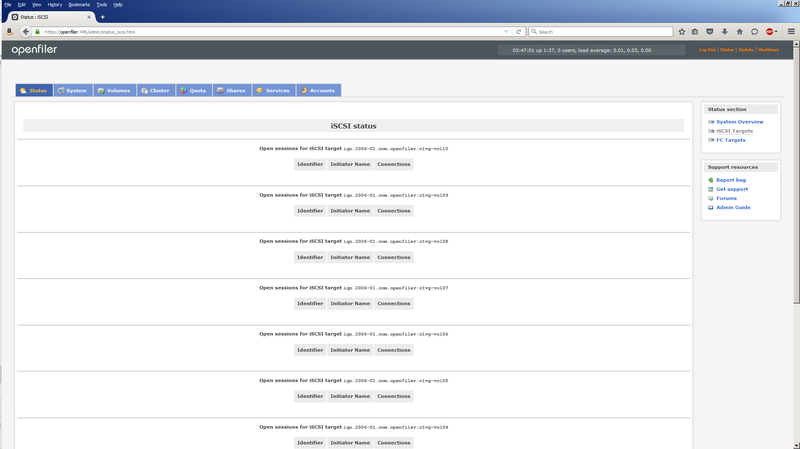 Task #3, Step #4/6: Configure automatic iscsi client login (ALL nodes). Note, these commands do not produce any output. Which is a little unfriendly, but don’t be scared! 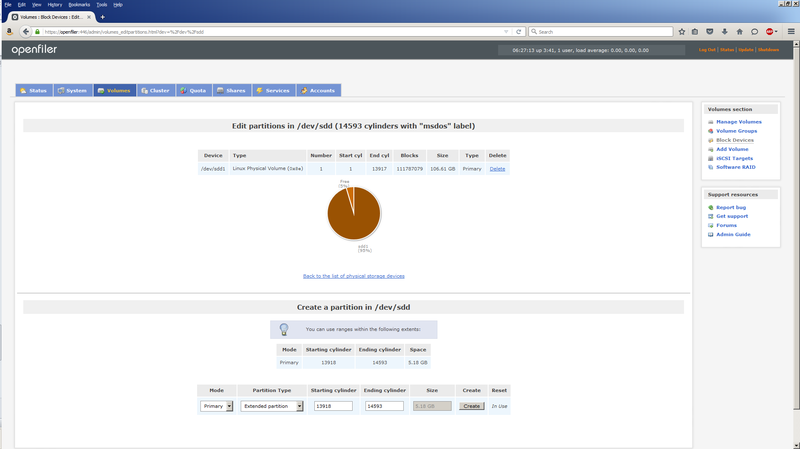 Task #3, Step #5/6: Partition the disks (ONE node only). Building a new DOS disklabel with disk identifier 0xdce55f18. Note, partitioning the disk devices is only done from ONE node. 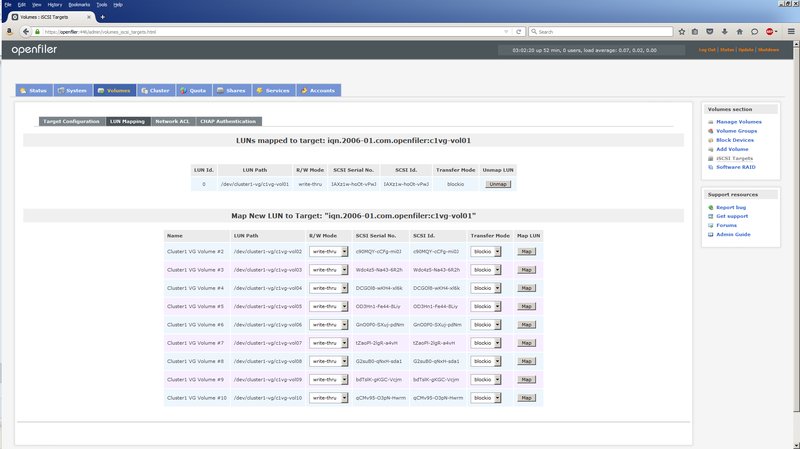 Task #3, Step #6/6: Configure persistent device names for iSCSI targets (ALL nodes). The discovery of the iSCSI targets by Oracle Linux just happened to map c1vg-vol01-lun-0 to /dev/sda, c1vg-vol02-lun-0 to /dev/sdb and so on. After the next reboot, these mappings may change. We need to avoid that and instead have a consistent iSCSI target to disk device mapping each time the server starts. This is achieved using an Oracle Linux device mapping utility called udev. Note, using Oracle’s ASM library driver (Task #4 Steps #1 & #2) can also achieve the same thing udev does, i.e. a consistent mapping between iSCSI targets and disk devices. Thus, configuring udev is, strictly speaking, unnecessary. That said, you can use udev or ASMlib or both if you want to. This procedure uses both, just to demonstrate both ways of doing the same thing, one with Oracle’s help (ASMlib) and one without (udev). Next, create a udev rules script called 99-oracle-iscsi.rules and place it in the /etc/udev/rules.d directory where udev can find it. Note, the 99 signifies the order in which the script will run. Lower numbered scripts run first. The “oracle-iscsi” part is just our way of identifying the script as being related to Oracle. The “.rules” part makes it a rules script. Only two entries need to be changed for each disk device. The RESULT parameter needs to be set to the ID output by the scsi_id command for each disk device. The NAME parameter needs to be set to the naming convention you wish to follow. In the above example, I’m using iscsi/asm-disk01 for /dev/sda. The NAME parameter for /dev/sdb will therefore be, iscsi/asm-disk02 and so on. Repeat this step for ALL nodes in the cluster. 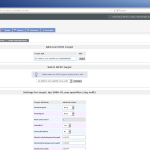 Task #4: Configure Oracle ASMlib. Only a couple of steps to follow here to configure ASMLib. 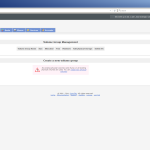 Task #4, Step #1/2: Configure Oracle ASM library driver (ALL nodes). 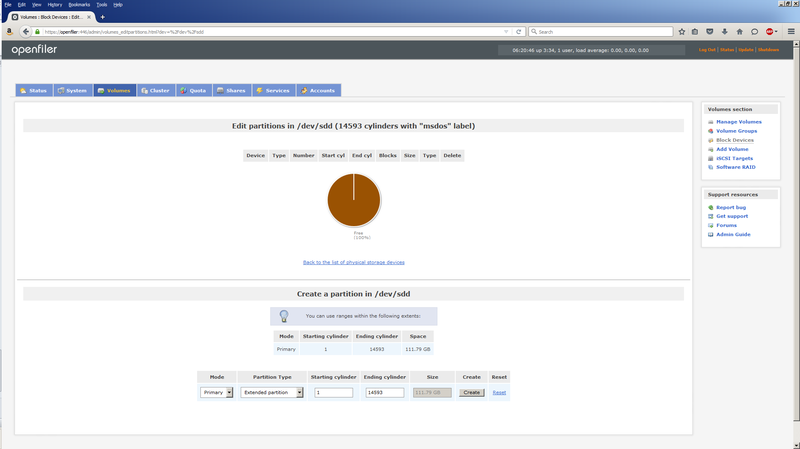 Task #4, Step #2/2: Create ASM disks (ONE node only). Device "/dev/iscsi/asm-disk01" is already labeled for ASM disk "ASMDISK01"
They can also be seen at the OS level. So we can see that ASMDISK01 maps to /dev/sda1, ASMDISK02 maps to /dev/sdb1 and so on. Note, for Oracle Database 12c there is a new mechanism called the ASM Filter Driver. Obviously we haven’t used that here. Maybe when we re-visit this section in the future we can migrate to using that. So there you have it. Shared storage configured and ready to go. 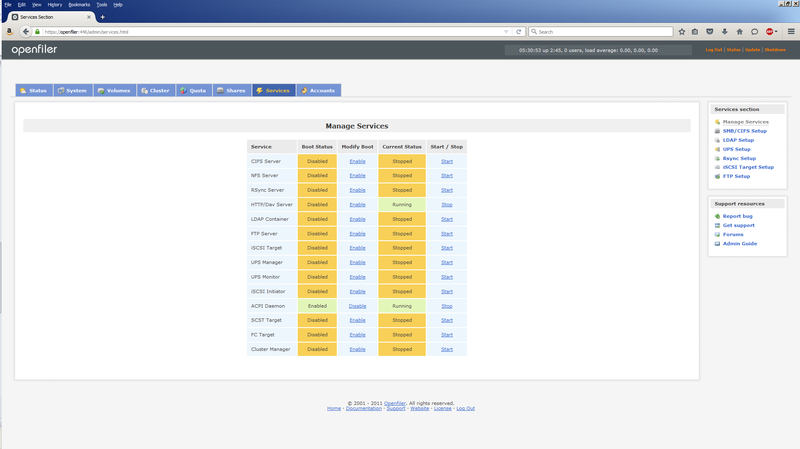 Everything is now in place for a successful install of the Grid Infrastructure and database software. See you in Part 10 for that.